Please note that ndnSIM 2.0 has major refactoring and simulation scenario written for previous releases most likely would need to be changed to run on ndnSIM 2.0 platform. Such integration with ndn-cxx and NFD ensures that the simulations are maximally realistic and can be reproduced in real environments with virtually no changes to the source code. In addition to that, any experiments with NDN forwarding (e.g., custom forwarding strategies) inside ndnSIM can be directly used within the real NFD implementation. Specifically, the simulator directly uses NFD implementations of pending Interest table (PIT), forwarding information base (FIB), and content store data structures. In addition to that, ndnSIM allows experimentation with ndnSIM-specific content store along with its cache replacement policies ported from the previous version of ndnSIM. ndnSIM is implemented as a new network-layer protocol model and can run on top of any available link-layer protocol model (point-to-point, CSMA, wireless, etc.). In addition, the simulator provides an extensive collection of interfaces and helpers to perform detailed tracing behavior of every component, as well as NDN traffic flow. Overall structure of ndnSIM is described in our technical report. Also, you can join our mailing list to see and participate in discussions about ndnSIM implementation and simulations in general. Do not forget to check mailling list archives. The code of ndnSIM is in active development. Bug reports (issues) as well as new feature implementation are always welcome. To file a bug report, please use NDN Redmine. To create new feature, please fork the code and submit Pull Request on GitHub. And of course, our mailing list is the best way to communicate with and get support from ndnSIM team and other users of ndnSIM. 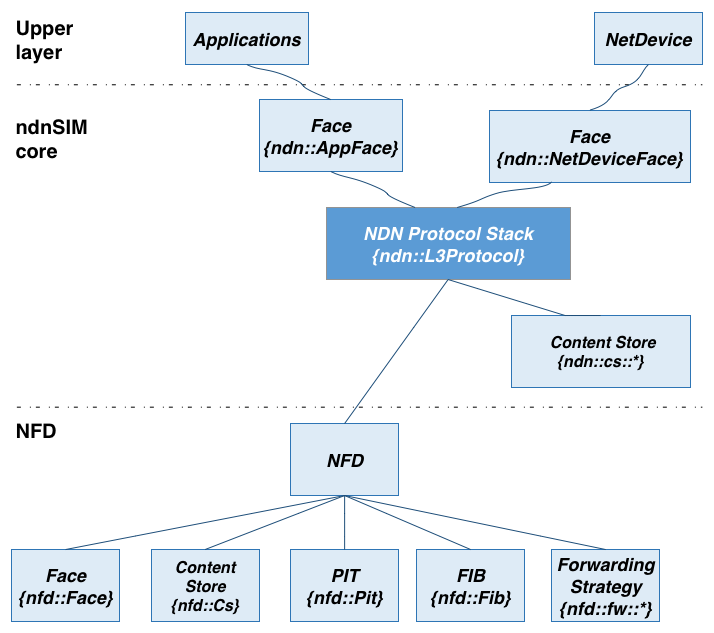 model/ implementation of NDN base: L3Protocol, faces (Face, NetDeviceFace, AppFace), etc. Refer to the source code and NS-3 documentation to see what logging interfaces are available and about details how enable one or more logging interfaces. Please remember that logging is enabled only in debug mode. When simulator is compiled in optimized mode (./waf configure -d optimized), logging will be completely disabled as it significantly slows down execution. A list of log components available in the current version of NS-3 and ndnSIM is listed in this page.